Leisa Cearney was instantly struck by the portrait of a well-dressed couple abandoned at a rubbish dump in rural Australia. She was determined to reunite them with their family. Through the power of social media and some good luck, she did just that. Ms Cearney lives in Stanthorpe in the south of Queensland, near the border with New South Wales. 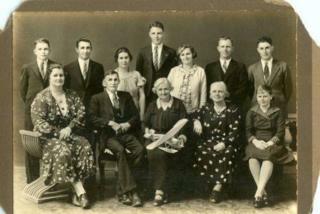 She is a historian and “passionate about family history” and turned to Facebook in her hunt for relatives of the couple. “I assumed it must be a local couple, so I put it on a community page,” she said. However, it was not a local relative who came forward. About 1,500km (935 miles) further north in Home Hill, near Townsville, 78-year-old Eleanor Torta was scrolling through her Facebook feed when she saw Ms Cearney’s post. She recognised the couple instantly. She saw the post after a friend shared it but, coincidently, Ms Torta had already spent that day tracing her family tree. 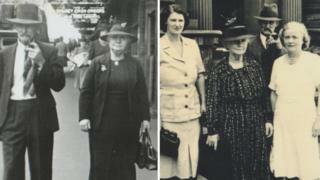 She contacted Ms Cearney explaining that the couple were her grandparents – Tom and Amelia Jones. The portrait, which was taken to the dump after an elderly relative became ill and moved into residential care, is being reunited with Ms Torta this week. When she saw other photographs of the couple, Ms Cearney says she “knew straight away it was them”. Ms Cearney said she “got really emotional” when she spoke to Ms Torta on the phone. Ms Torta said that she is “extremely grateful” to Ms Cearney for rescuing the photograph and enabling her to “keep the portrait in the family”. The recovered portrait of Tom and Amelia is a black and white photograph that has been hand-coloured with paint or ink. This technique was popular in the early 1900s. 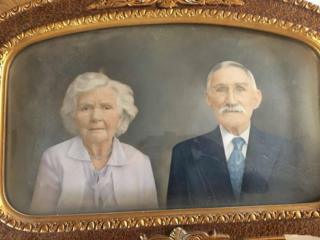 Ms Torta is not sure when the portrait of her grandparents was taken, but estimates it must have been more than 70 years ago. The back of the frame is stamped with “Empire Art Co. Pyt. 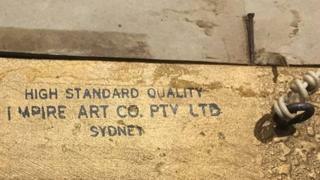 Ltd.” Records show the businesses was established in Sydney in 1920. Ms Torta says that she has been impressed by the power of social media to connect people. “I have only got on to Facebook in my old age. I see some things that I don’t like on there, but it is amazing what you can find.